This is not technically a Neil Young album. However, the original pieces included are Neil's, and I don't have much time today. 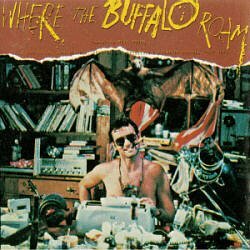 WHERE THE BUFFALO ROAM (1980) is a movie about the life of Hunter S. Thompson, with Bill Murray in the lead role. The movie has its problems, to be sure. I'm not going to lay much of the blame on Bill Murray. I'll just leave it at that. As far as the soundtrack goes, it's a decent collection of late '60s tunes by some major artists, some movie dialogue, Bill Murray shrieking through a version of "Lucy in the Sky with Diamonds", and Neil's originals. Before you kill yourselves trying to find it, I'll let you know that all of Neil's contributions only total to approximately 10 minutes. Bottom line: I'm totally glad I have this (It was a GREAT gift from a close friend). And, if you ever get the chance to hear Neil's "Home, Home on the Range" you defintely should. That said, I'd make sure you get some of his more essential releases first.